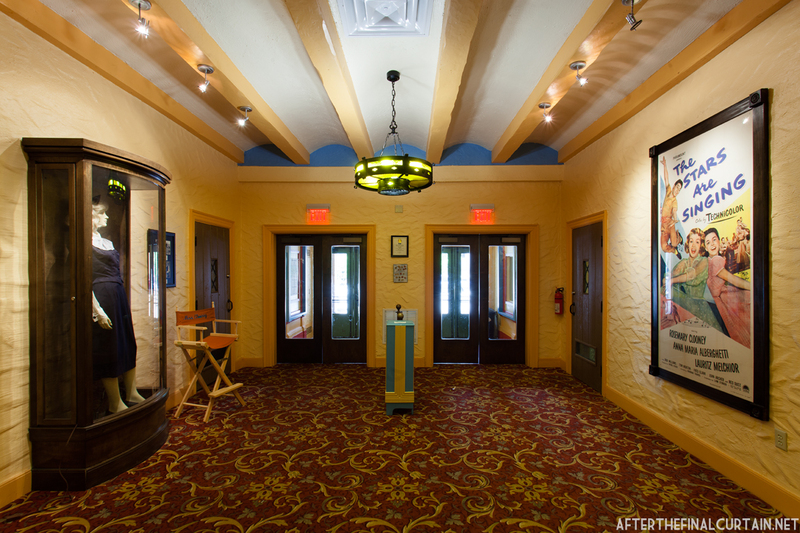 The theater’s lobby has already been restored. 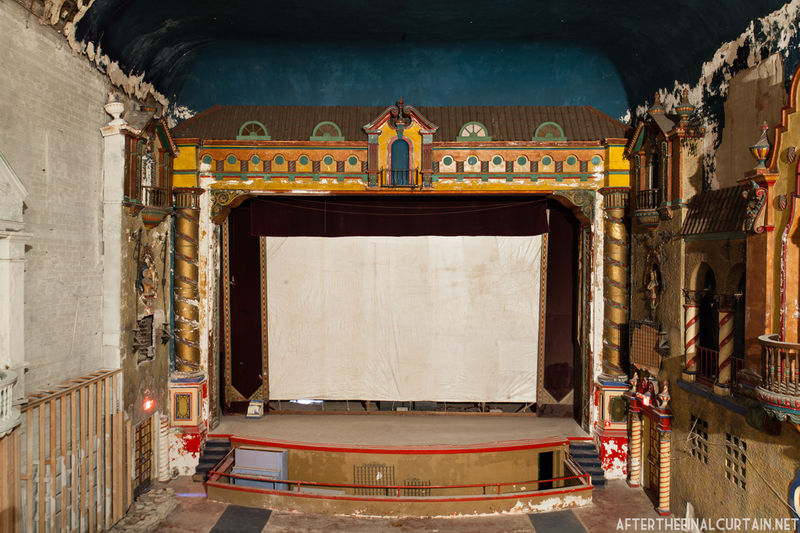 The atmospheric-style theater opened with the movie “Whoopee,” starring Eddie Cantor. 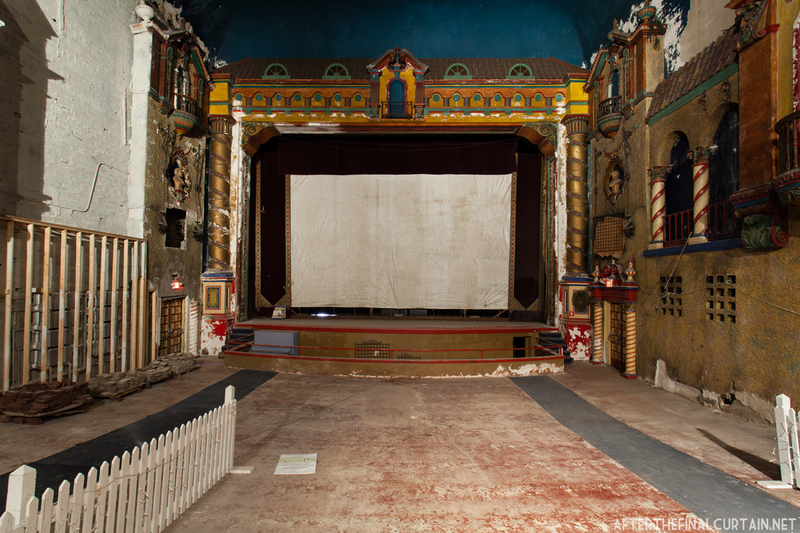 It operated primarily as a movie house, but did have some vaudeville shows in the early years. The world premiere of “The Stars are Singing” was held at the Russell in 1953. Rosemary Clooney, the star of the film, was born and raised in Maysville. Rosemary Clooney wore this outfit in her film ” The Stars are Singing”, which premiered at the theater. 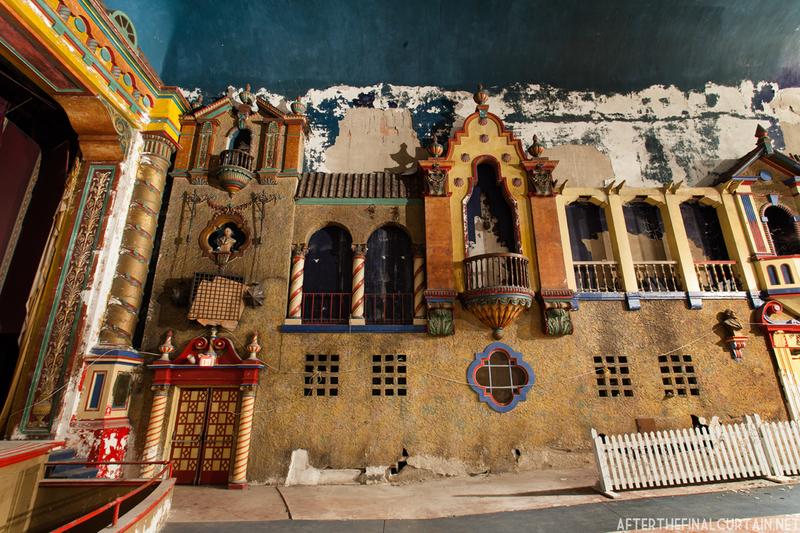 After the theater closed in the early 1980s, the building was used as a restaurant, clothing store and used furniture store before being abandoned. During that time, a storm ripped part of the roof off, causing water damage in the auditorium. 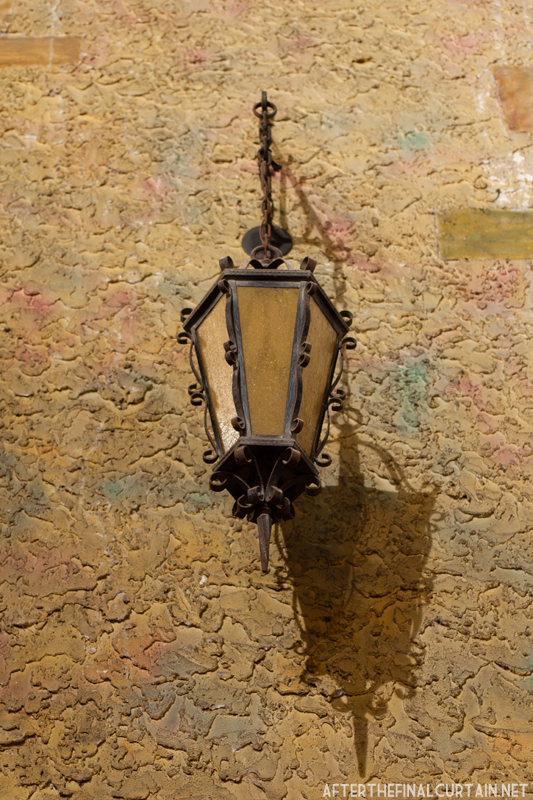 A close of up of some plasterwork in the auditorium. The upper area of the balcony was used as segregated seating for African Americans. It had a separate entrance as well as a separate bathroom. 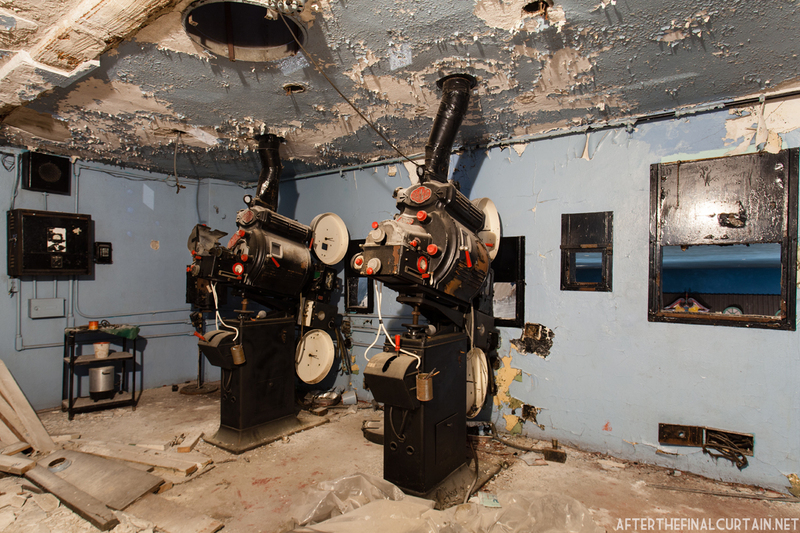 The projectors remain in the projector room. 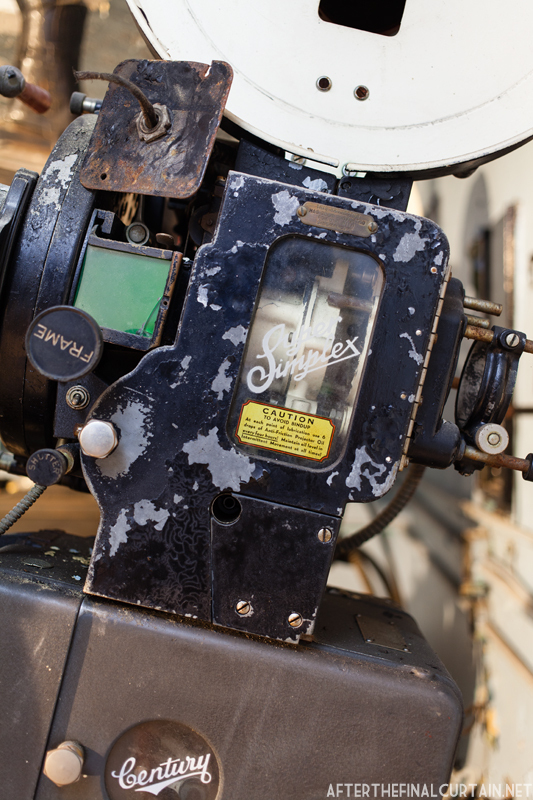 A close up of one of the projectors. 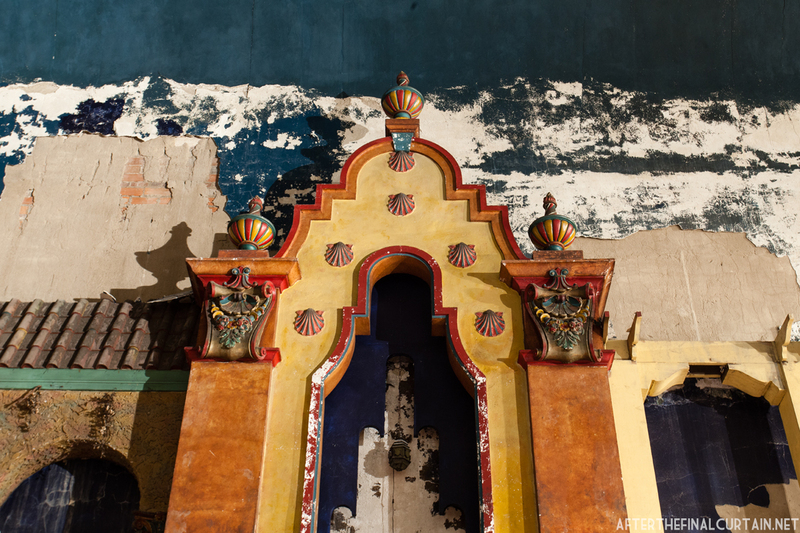 This wall was undamaged during the years the theater was abandoned. To add to the atmospheric effects, a rainbow was projected across the screen after every show. 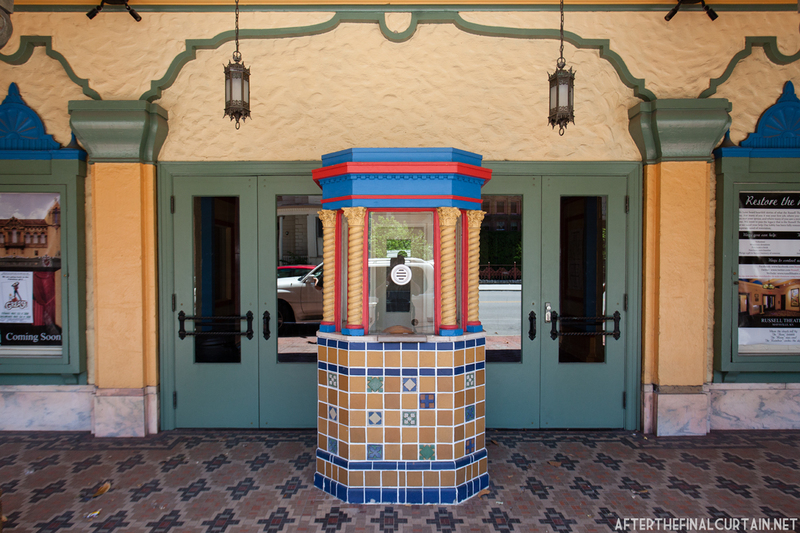 The theater marquee was restored in 2002. 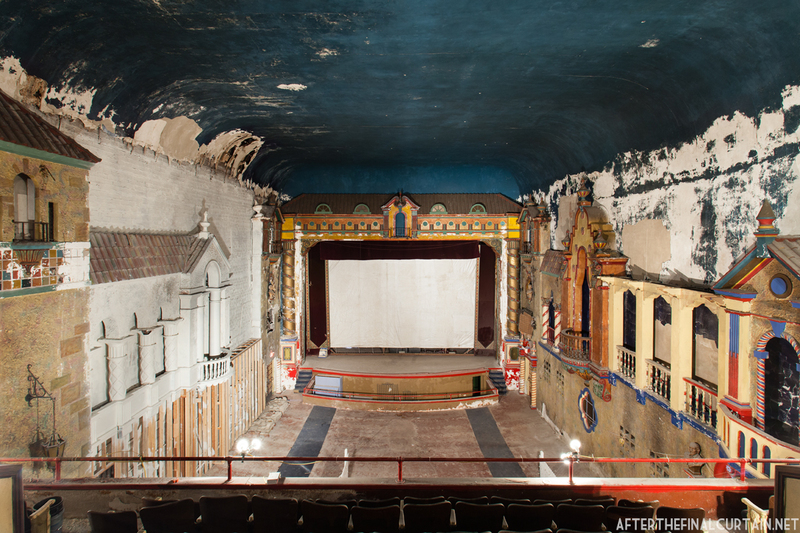 Except for a few rows in the balcony, the seats were sold to another Kentucky theater. Thanks Roy! 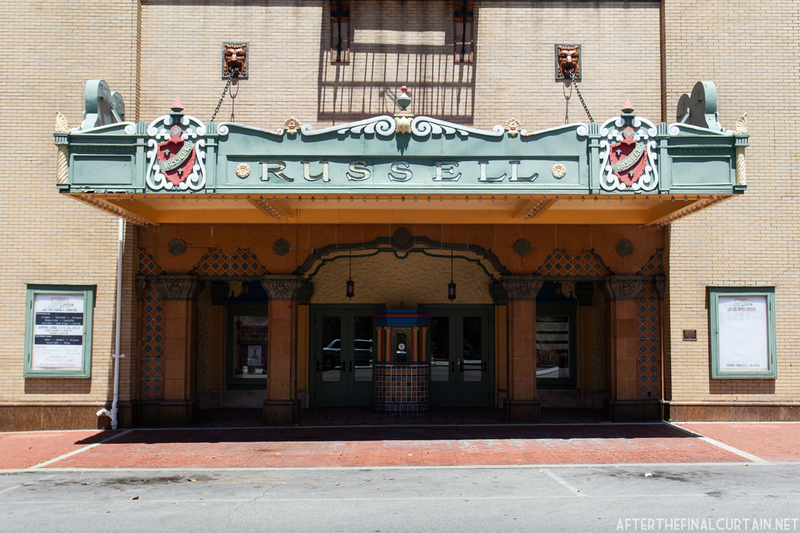 Luckily, the Russell has a group of people working to restore it. Hi Steven – Nope. There wasn’t a traditional lighting board. I made a point of checking for you. The Russell has so much potential of being a cultural and educational center in North East Kentucky. It is a treasure that the children of today don’t get to fully understand because the only movies they have seen are at cinema complexes. 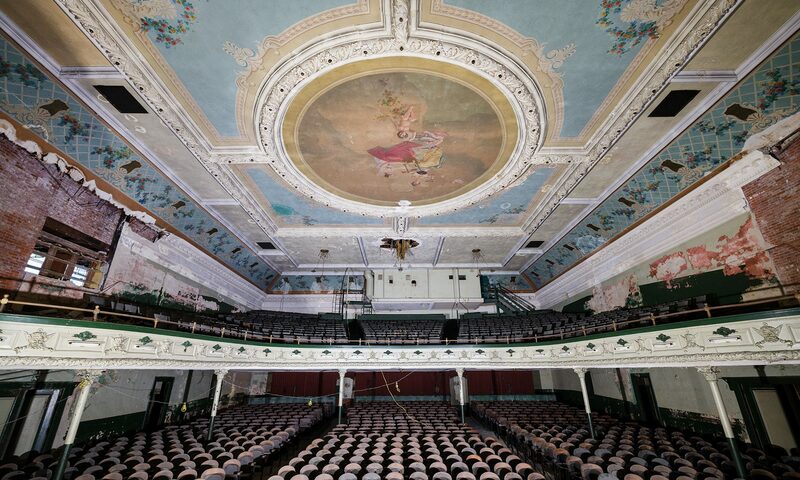 The renovation of a true atmospheric theater is necessary for the preservation of an art form in itself. I agree Tandy! Atmospheric theaters have become quite rare, and should be preserved. 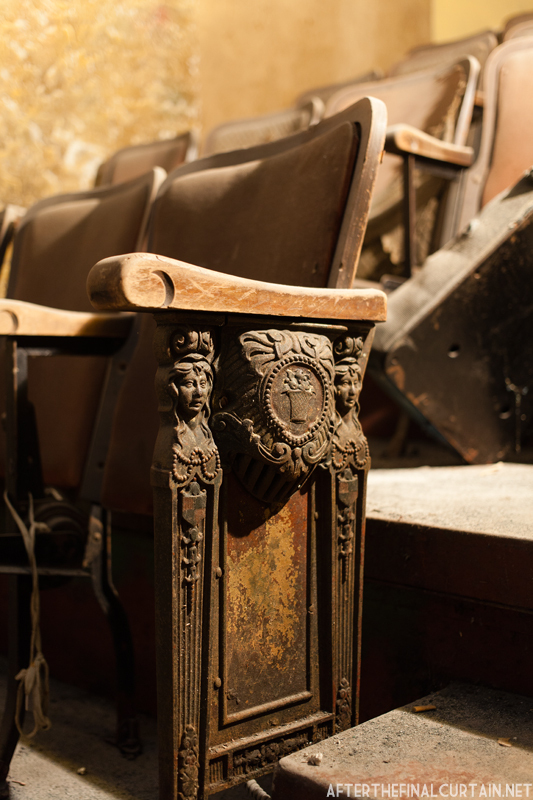 Matt- you continue to amaze me with your eye for all of the wonderful detail in these old theatre spaces. Such great photo work. As you know – sometimes it takes entirely TOO long to get these spaces up and productive again. Awe inspiring- truly. Keep up the great work that you do. Patrick (Variety-Cleveland). Thanks Patrick! Hope everything is going well over at the Variety!